Shelby is two, and I am at Walmart. I see this Pegasus-Unicorn costume on a clearance rack, for like $4.00. I know that she will love it. She is just that kind of little girl. We have only been in Utah for a year, but already she LOVES grandma's horses. So I buy it. She wears it for dress-up sometimes, and then all the time, and then she NEVER TAKES IT OFF. I seriously have to sneak it away from her to wash it. She doesn't just wear it either, she becomes it. She IS a PEGASUS/UNICORN. And as I have mentioned before, to be not just a horse with a horn, but a magical horse with a horn AND wings, is VERY special! Her pre-school teacher asks me one day if Shelby has a limp, and I reply, “No, that is a gallop.” My girl doesn't walk, she trots wherever she goes. And then it happens. One day the costume accidentally gets put in the dryer. And the beautiful mane turns in to Jheri curl. 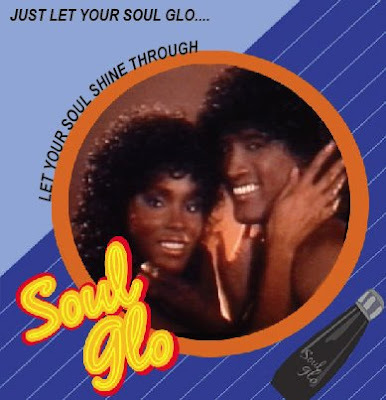 Remember “Soul Glo” from “Coming to America”?...yeah THAT is what I am talking about. I put it in a pile to take to the D.I. But it keeps finding it's way back down in to the playroom. And as Shelby grows, the legs get shorter and shorter, until it becomes capri-style. She can't look up when she has the head on, because it is so tight. But still- she wears it every day. We have 20 other costumes hanging up. Poodles, princesses, other unicorns...but only THIS costume will do. None of her friends are allowed to wear it. It is sacred. So Halloween is coming up. She has THREE new princess costumes. I ask her what she wants to be. Why, I don't know, because in my gut I know the answer. And she gives it to me “A Pegasus/unicorn”. I look at the ratty old costume and sigh. I am determined to replace that old costume. So I search all the stores. NOTHING. No one is making unicorn costumes this year. Target, Walmart, Shopko, and even the online and catalog stores. That is when I decide to try E-Bay. I have never done E-Bay. It scares me. I know that people makes zillions from selling their junk on it. I just don't get the whole process. But I am determined. 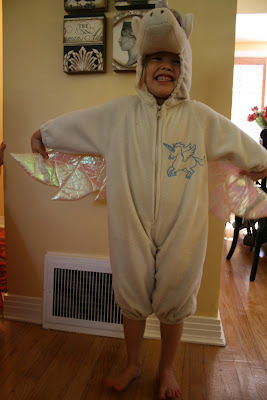 I type in the description “Unicorn Pegasus costume” and JACKPOT!! Not only do two costumes appear, but they are the EXACT costume from Walmart (one is white like her old one, and the other is purple...oooh, fancy! ), just a bigger size (4-6) instead of (2-4). So my heart is racing. I know that Shelby will give up her old one for one of these...she may even like the different colored one! I check out the descriptions. Looks like they have been worn only once, for Halloween. They come from different sellers, but it looks like they don't smoke, and the costumes are in pristine shape. So I figure out how to place a bid by updating my PayPal account, and decide to bid on both, just to be safe. This way I know that I am guaranteed to get ONE for sure! The opening bid on the two of them is $8.00, so I place bids for $8.50. Then I notice that there is a button asking me if I would like to be notified when there is a new bid, so I click “Yes”. I NEED this costume. I am desperate. The auction ends in two days. I am checking my email a few hours later and there is a new email from EBAY. It says “WARNING, you may be outbid. Some one has just bid on the Children's White Pegasus Costume”. Oh my goodness, thank goodness they alerted me. Can't have some other mom with a Pegasus-obsessed child sneaking this costume out from under my nose! So I go on to EBAY and up my bid to $9.00. Then I notice a button that says AUTOMATIC BIDDING. That sounds convenient. So I check it out. I am supposed to tell them what is the absolute MOST amount of money that I am willing to spend on this costume and then any time someone else places a bid, it will automatically place a higher bid for me, until it reaches the limit that I have set. Cool! SOOO, what IS the most that I am willing to pay for this polyester creation, that will mean the world to my daughter? Well, how about $40.00. The shipping is another $12, so I don't want to break the bank here. And the original one did only cost me $4.00. Plus it was probably only made for about $.50 by some poor gal in China (gotta love that globalization) So, I figure that I am REALLY SAFE here... AUTOMATIC BIDS on both for up to $40. No other mother can be THIS nuts! I have to get one of them! Why had I thought that this whole EBAY thing was so hard? I figured it out pretty quickly...yeah me! The next day I turn on my computer, check my email, and WHOA, looks like there has been a lot of activity on these Pegasus costumes! Word musta spread and now EVERYONE is out to get them. My inbox is FULL of notices from Ebay telling me that it has just bid again and again for me. Thank goodness for that handy automatic bidding! When I get on to Ebay I see that I am still the high bidder for the white one...phew! But the price is now $35.00 Wow. So, I go check out the purple one and it's price is climbing too...up to $27. The next day I check my email. Only hours to go, and I am still ahead. That automatic bidding has truly saved me. They don't list people's names but a***r, and k***m looked like they really want it too. Jeez, I better up that auto bid one more time to $45, just to be safe. I have heard about these people who sneak in at the last minute, like a vulture and bid $.01 higher, stealing it right out from under you! And the next time I turn on the computer...HOORAY! It's mine. 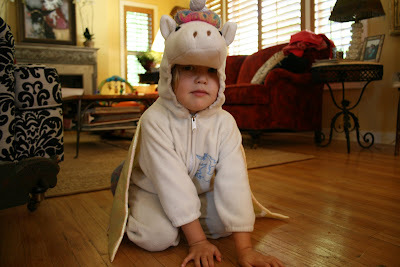 My email has a message saying "Congratulations, you have won the Children's White Pegasus Unicorn Costume!" Lucky me!! I log in and it says I used every dime of that $45. Good thing I upped it at the last minute. And neener, neener, neener to old a***r, and k***m...whoever you are! You blew it, better luck next time! 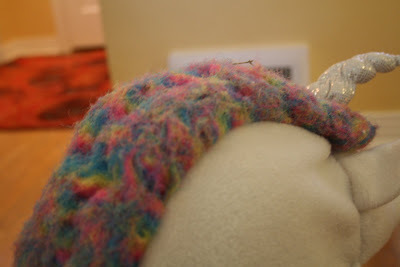 And then I see another note on my Ebay page "You are the high bidder for the Children's Purple Pegasus Costume." Oh yeah, better get out of that one. Definitely don't need two overpriced Pegasus Unicorn costumes. But it is too late. The system won't let me undo my bid. And there are only hours to go before this auction closes as well! 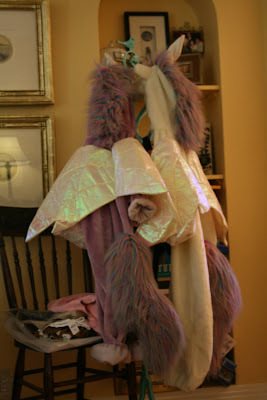 When I check back later, to my dismay, I am now the proud owner of not one, but TWO Pegasus Unicorn costumes for my daughter. Oh well, one for her, and one for a friend. She does guard that thing like it is the holy grail. This will be nice for her to get to dress up and have one for her friends to use to. Yikes, I tally up the damage. Over $80 for the two of them. Well, she will love them...she better! And then, after I pay, I see a sign that says "Show bidder identity" (or something to that nature). I am curious, who was I up against? Who were these LUHOOSERS who got their trash kicked by me?? I take them to my tailor, Raheem. He tells me that he basically has to reconstruct the entire thing. The tail is so long it drags on the floor. "Ok, how much?" "$40, $20 each". "Yikes, this costume is now going to be worth more than most of the pieces in MY wardrobe! She better wear this damned thing every day! So I say, "Do the purple one first. We'll save the white one for next year." A few days later I tell her about saving the white one, but she declares that THAT is the one she REEEALLY wants to wear. (Murphy's Law) So I call Raheem back, and tell him to do both. After a few days we drive down to pick them up. Shelby has been pacing the floor, with anticipation. We go home and try them on. Beautiful, gorgeous, worth every penny. And then Halloween comes. "Shelby, are you going to be the purple or the white Pegasus for Halloween?" "Weeell...I think that I am going to be a cat." That story is hilarious! That is totally something I would do! I am pretty much an idiot when it comes to Ebay. It's amazing what we will do as parents to keep our kids happy. Ashley....do you make this stuff up? It is so funny.....well now it is, right?!!! p.s. Does Raheem have a brother in my neck of the woods? I'm too nervous to take nice jeans to a tailor here. I am so sorry about the ebay mishap. I don't like ebay much myself either. I prefer to physically pick something out, pay for it and take it home right then. this might be one of the funnies things i've ever read!! only because i have done the same thing on ebay!! I once accidentally won a motorcycle in my boyfriends name cause i was bidding as a joke!! Let's just say I got the third degree for days!!! you are the cutest mom to go to such lengths foe a costume!! Shelby is one lucky girl! !